Very rarely is there a book I’m anticipating that doesn’t live up to its potential. The Scorpio Races by Maggie Stiefvater is one of those unfortunate few. Every first day of November, the dangerous and compelling Scorpio Races take place. Highly dangerous — and rewarding — the races show just who the best riders of the wild sea horses are. The horses (called capella uisce, which is Irish and I’m not going to begin to translate or attempt to pronounce), who come from the waves of the ocean (as true steeds of Poseidon did, if you follow Greek mythology), are captured and raced, oftentimes killing the rider in the process. It is widely known that the race isn’t as dangerous as the actual riding of the horses, however, as the wild sea horses will kill a rider if their attention falters for just a moment. Puck Connolly is too young to race, says her older brother and guardian. However, with her older brother threatening to leave the island for work on the mainland, Puck takes it upon herself to enter the dangerous race. Despite his insistence that she do not, she is entered to race at the tavern. Everyone is nervous and excited about the race, and Sean Kendrick, the youngest winner in the history of the Scorpio Races (and defending champion), has entered once more. Sean Kendrick is a skilled rider, without a doubt one of the best. One has to be if they win the Scorpio Races. Orphaned at a young age and raised by a horse breeder, Sean quickly “tamed” a capella uisce which he rode to victory the previous year. He and his horse share a unique bond, one that most riders can never claim to have. However, Sean faces a minor dilemma before the upcoming races: he kind of has a thing for his competitor, Puck. There is much talk throughout the book of the races, but that’s all it is, talk. The focus is more on the daily wonderings of a young girl with a crush and a slightly older boy with a similar crush. The actual races takes place, and while some suspense is there, one might find themselves no longer caring who wins. Horses run, riders hang on, people fall and die, race ends. You find yourself more interested on which main character is going to win, not whether or not one of them will. This is danger of having two main characters with two point of views. The writing is slow, but interesting at times. However, with the rapidly shifting POV (sometimes it’s three or four paragraphs before the viewpoint changes), it was hard to be drawn in by the characters themselves. Also, a minor complaint (and it happens when writing first person POV for more than one character, I understand), but the voices of Puck and Sean were nearly identical. It was hard to differentiate their personalities at times because they were so similar (a complaint I’ve had with other characters in the past). The story is interesting, don’t get me wrong. I just wish it didn’t take the entire length of the book for something to happen. There’s a gigantic build up of tension and drama, and the ending left a lot to be desired. There is a lot of potential with this novel, and having enjoyed Stiefvater’s Shiver series, I had expected a lot more. Unfortunately, I was left with an “OK” book. Nothing amazing, not too bad, but just… there. Sad, really. 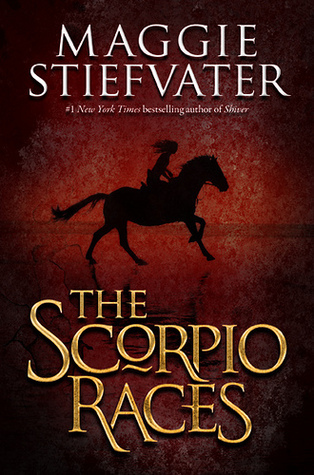 The premise is awesome and I really was looking forward to reading about the Scorpio Races. This entry was posted on November 11, 2012, 4:18 pm and is filed under Book Review. You can follow any responses to this entry through RSS 2.0. You can leave a response, or trackback from your own site.